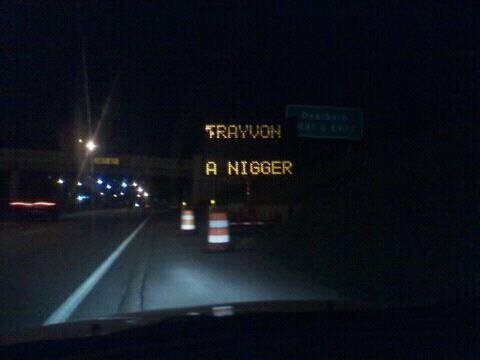 Michigan construction sign calls Trayvon Martin the N-word!?!?! DEARBORN, Mich. - Motorists in Dearborn report seeing a racial slur on a construction sign along I-94 overnight. The digital roadside sign displayed the message: "Trayvon A N***er", a reference to Trayvon Martin, the Florida teen who police say was gunned down by a neighborhood watch volunteer in February. "The portable sign has a panel that was broken in to," said MDOT spokesman Rob Morosi. "The message was changed and the keyboard was actually stolen." FOX 2's Amy Andrews reports the message was displayed for over an hour until workers were able to power down the sign. Michigan State Police are investigating. Anyone with information is asked to give them a call. But somebody said we were living in a post racial society.